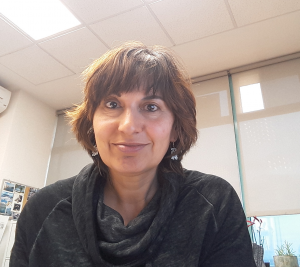 Meritxell Riquelme is a Research Professor and Chair of the Department of Microbiology at the Center for Scientific Research and Higher Education of Ensenada (CICESE), Baja California, Mexico. She completed a BA degree in Biology at the University of Barcelona, Spain. She received an MSc degree in Plant Pathology and a PhD in Microbiology from the University of California, Riverside. During her PhD thesis in Salomon Bartnicki-Garcia’s lab she investigated the role of the Spitzenkörper in hyphal morphogenesis. She was a postdoctoral fellow at the University of Oxford, United Kingdom, in Lorna Casselton’s lab, where she worked on mating type genes of Coprinopsis cinerea. Her current research combines advanced life microscopy techniques and molecular biology to study secretory routes of vesicles involved in the polar growth of hyphae of Neurospora crassa. She also studies the ecological distribution of Coccidioides, the fungus that causes Valley Fever in semi-arid regions of Baja California. More recently she has explored the fungal diversity of deep-sea sediments off the Gulf of Mexico. She has taught the graduate course Biology and Taxonomy of Fungi since 2006. She served as graduate advisor of the graduate program of Life Sciences (2007-09). She is editor of Fungal Genetics and Biology, and The Cell Surface. She has been editor of special issues for Fungal Biology (2011), Mycologia (2016), and The Cell Surface (2019). She has served in the Mycological Society of America as member of the Karling Lecture Committee (2005-08, chair 2007-08) and the Genetics and Cell Biology Committee (2008-10, chair 2009-10), and as councilor for Cell Biology/Physiology (2014-16). She was elected as a member of the Neurospora Policy Committee (2008-12), the Fungal Genetics Policy Committee (2013-19), International Fungal Biology Conference Steering Committee (since 2014), and Executive Committee of the International Mycological Association (since 2014).